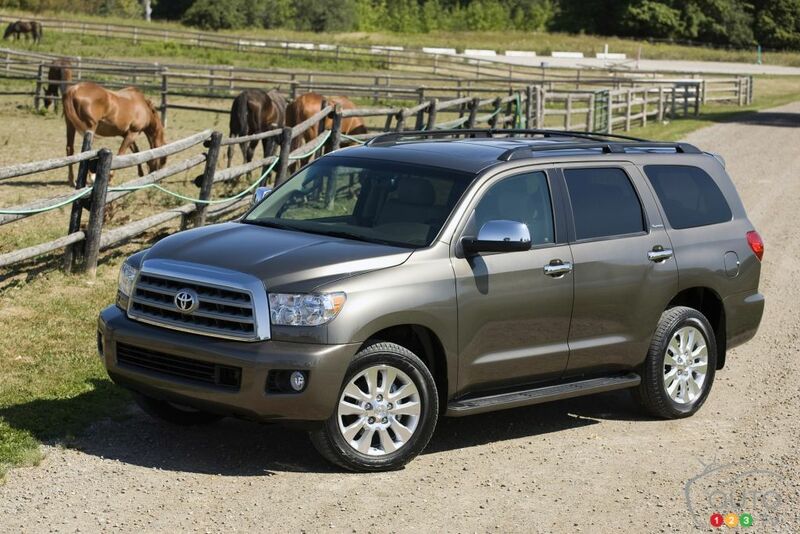 The Toyota Sequoia has long been a safe, reliable choice for full-size SUV buyers in Canada. What does it have to offer for 2017? Here’s all you need to know. First, motivation comes from a 5.7L V8 engine that generates a massive 381 horsepower and 401 lb-ft of torque, harnessed through a 6-speed sequential shift mode automatic transmission. One-touch, on-demand 4-wheel-drive, active traction control, and trailer sway control make for easy driving, Toyota says, while the factory-installed towing package allows owners to tow up to 3,175 kg (7,000 lbs). Cargo capacity, meanwhile, amounts to 540 litres behind the third row, 1,890 litres behind the second row, and approximately 3,400 litres with all the rear seats folded. That’s huge! Toyota’s Star Safety system (ABS brakes, Brake Assist, Electronic Brake Force Distribution, Vehicle Stability Control, Traction Control, Smart Stop Technology) is included along with eight airbags, a direct tire pressure monitoring system, and automatic headlamps. Curiously, while select models offer a blind spot monitor and dynamic laser cruise control, the full Toyota Safety Sense suite of advanced safety technologies doesn’t appear on the menu (yet is standard on a 2017 Corolla—what’s up with that, Toyota?). 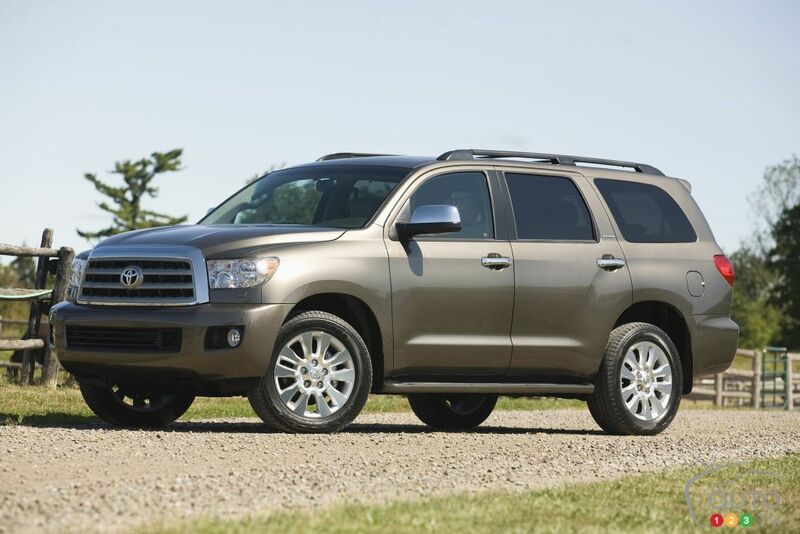 – 2017 Toyota Sequoia SR5 (starting MSRP $56,525), with leather seats and steering wheel, an 8-speaker 6.1” Display Audio system, Bluetooth connectivity, an auto-dimming rear view mirror with integrated compass, 3-zone automatic climate control, heated and power adjustable front seats, 40/20/40 split-folding second-row seats, power-folding 60/40 split third-row seats, a power liftgate window, 18” wheels, and more. 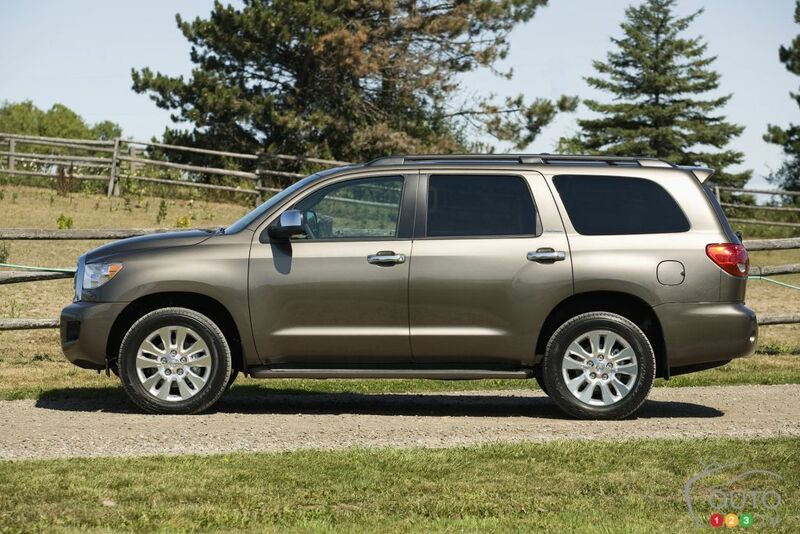 – 2017 Toyota Sequoia Limited (starting MSRP $63,130), with all of the above plus steering wheel-mounted HVAC controls, a power liftgate with jam protection, navigation, 12 speakers and more. 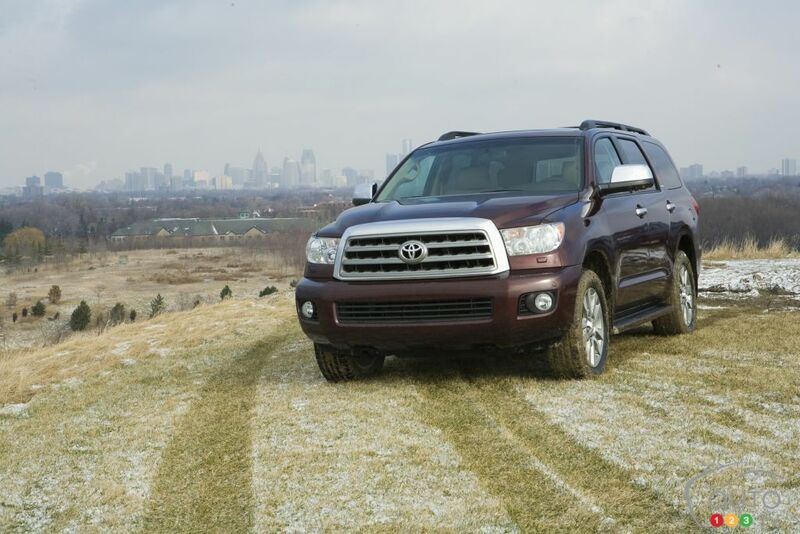 – 2017 Toyota Sequoia Platinum (starting MSRP $71,395), with seating for seven instead of eight (the 3-person second-row bench is replaced with two heated captains’ seats), heated and ventilated front seats, front and rear adaptive variable suspension, load-leveling rear air suspension, 20” wheels, rear-seat DVD entertainment with 9” monitor, and more.